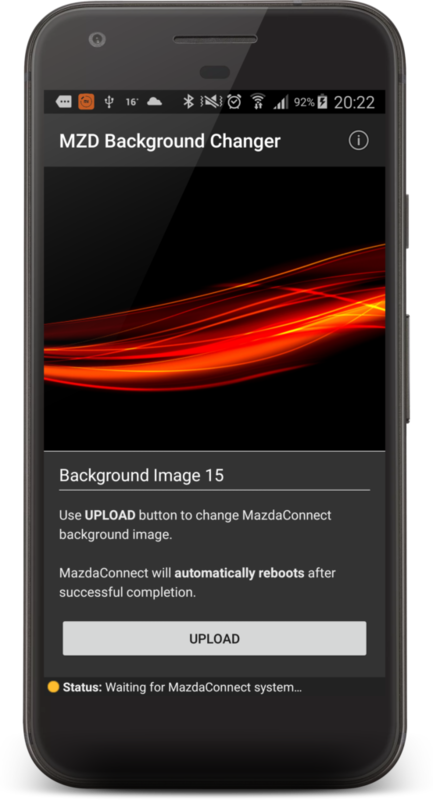 MZD Background Changer is a simple app which allows you to change background image of your MazdaConnect infotainment system – quickly and easily. Just download and install Android app and dedicated software on USB stick, select one of built-in samples or custom image and press ‘Upload’ button. That’s all you need to do! You don’t need any coding skills, laptop or WiFi connection – just Android app and one-click change – it couldn’t be easier! 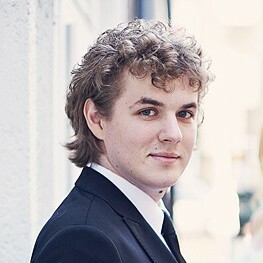 What is more, in comparison to others ‘tweaks‘, MZD Background Changer – used properly – minimize the risk of CMU brick! MZD Background Changer requires additional software installed into USB drive. Please watch Getting Started carefully before installation and follow the instructions herein. MZD Background Changer app requires additional software installed into a USB drive! Please watch Getting Started carefully before installation and follow the instructions herein. MZD Background Changer app is a “research project” and comes with ABSOLUTELY NO WARRANTY. This app can modify MazdaConnect filesystem – use it at your own risk and only if you know what you’re doing! All background images are part of the free and open-sourced mzd-background-changer project distributed under the GPLv3 license and hosted on GitHub. All images have been copied from MZD-AIO project distributed under the same license and also hosted on GitHub. 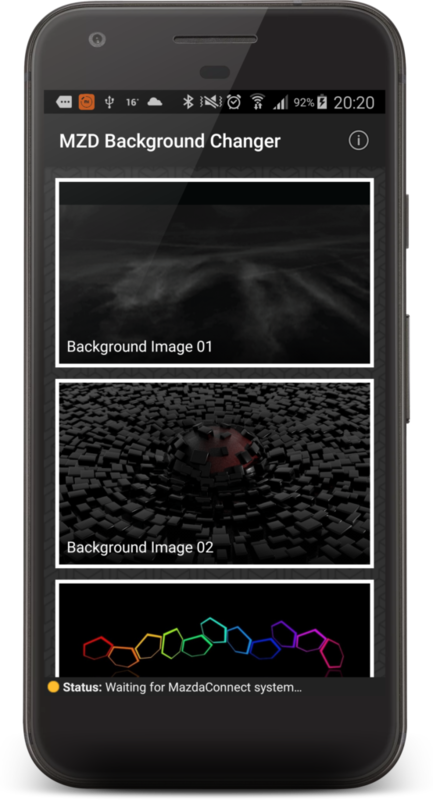 If you noticed that some of images are not properly licensed – please contact with Developer – such images will be immediately removed from mzd-background-changer project. MZD Background Changer needs USB debugging mode enabled on your phone. 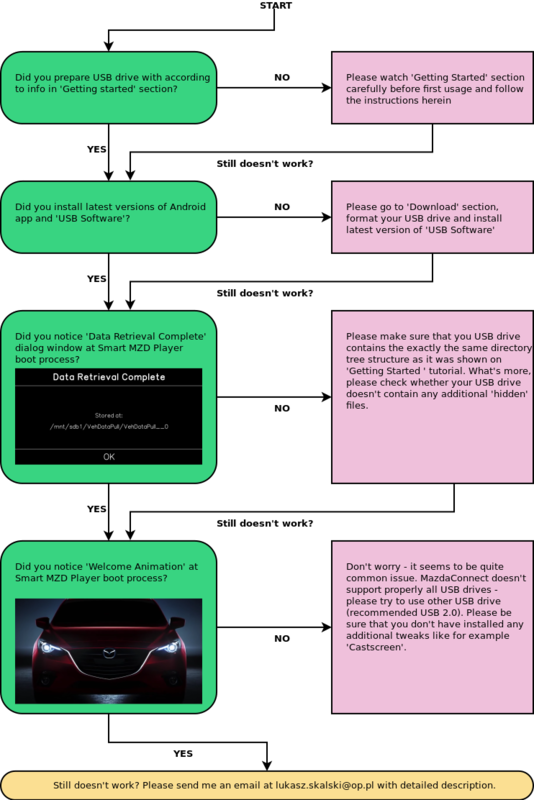 Before you start app, please double check whether USB debugging mode is enable, otherwise it will not be possible to start connection between Android app and MazdaConnect system. How to format USB 2.0 Drive to FAT32? Why do I need this? Android app shows only Waiting for MazdaConnect system… – how to deal with it? 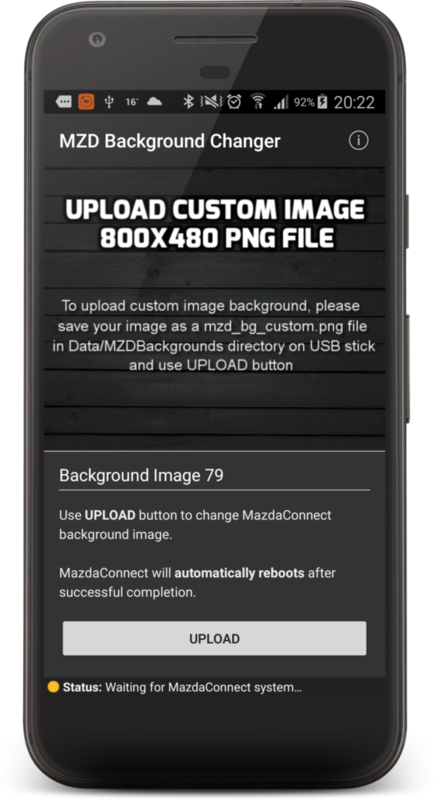 How to upload my custom image as a background for MazdaConnect? It doesn’t work, what now? Don’t worry – we will fix it together :) Contact with me at lukasz.skalski@op.pl and describe your issue in detail. Please also remember that MZD Background Changer is treated as a “research project“, designed to create more powerful infotainment system from already available resources, which are not always fully reliable.